Our supplies are rated for indoor or outdoor use. Because our supplies are made from a durable vinyl substrate, you can count on them holding up, even in harsh conditions. They are UV, scratch and chemical resistant. These supplies are made to last. Labels and signs need to be seen to be effective. Our label and sign materials come in a variety of colors, each with a specific usage and general usages. Use our labeling stock for compliance labeling, or for company-specific labeling. The labels and signs you will produce will be bold and easy to see, even from a distance. 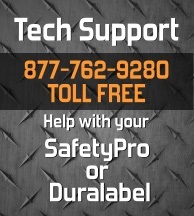 Do you need to label for OSHA or ANSI safety standards compliance? Our labeling materials are suitable for standards compliant labeling, and will help you pass your inspections with flying colors.